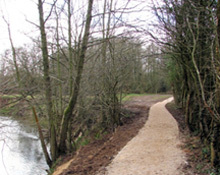 The Friends of the Bowdon Bollin (FOBB) was formed in 2007 to safeguard local countryside footpaths in the Bowdon Bollin Valley. 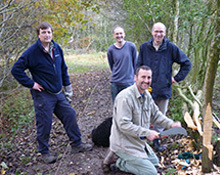 We have carried out many projects and rely on local residents volunteering to help. We need volunteers to help with non-native species eradication, litter picking, path improvements, funding and publicity. The River Bollin runs from the hills surrounding Macclesfield Forest to where it joins the Manchester Ship Canal at Bollin Point near Lymm. 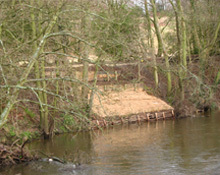 Our stretch of the Bowdon Bollin lies between Ashley Road, Hale, and the A56. This area provides the local community, and visitors, with access to the countryside and many walks. At just under 4 km this is a lovely circular walk crossing the Bollin twice and taking you through woodland, beside the river and across farmland, both arable and pasture. If you’re lucky you’ll hear the skylarks singing. 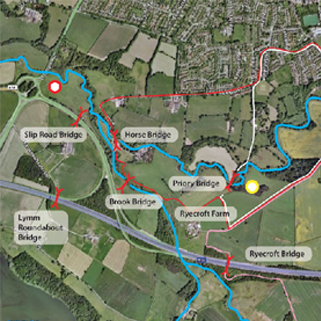 A longer version of the Priory Bridge walk taking an additional loop down to Birkin Brook and following part of the Bollin Valley Way. Both walks are virtually road free apart from Ryecroft Lane which has only a very occasional vehicle. This loop out to Ashley could take you out for a pub lunch if you detour into the village. In the spring there are particularly lovely bluebells if you head into the woodland before Ryecroft Bridge. Visitors image gallery – Please send us your photos! 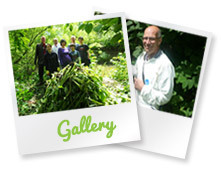 We would be very grateful if you could send us any pictures you have of the Bowdon Bollin so we can publish them via the website gallery.